Water is a precious resource around the world and especially in California where we receive our year’s supply between November and April. 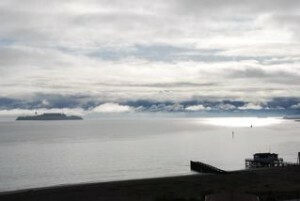 This past week was especially rainy and residents of the Bay Area are probably ready for a few sunny days. This year year to date, downtown San Francisco has received 18.11 inches of rain, just above our normal for the entire year! With another month of winter rains to come, our reservoirs will be full to capacity for the dry summer months. The rainwater catchment system on Alcatraz is nearing capacity with its current levels at 80% full. This is the second year the catchment has been in use and supplies enough water to meet the irrigation needs of the gardens for one year. Even though we choose drought tolerant plants, everything appreciates a drink to perk themselves up. I ventured out to the west side of the island during one of the downpours this past week to see the system at work: water catchment. Seeing the rain water flowing easily from the downspout into our basins was very satisfying, knowing that each drop will be used by the thirsty plants to get through the summer months. Even though the rain can be cold and unpleasant, the dramatic skies provide countless photo opportunities – so grab your camera and get outside. It is true, locals from the Bay Area are hard to find on the Rock. Usually deterred by the crowds of the summer, some people living in San Francisco have never taken the opportunity to discover what is in their own backyard. Local travel writer, Judy Zimmerman from Sacramento, finally made the trek, a short 10 minute ferry ride from Pier 33 that happens to take in the city skyline and waterfront and views of both the Bay Bridge and the Golden Gate Bridge, and found out why Alcatraz continues to be popular with visitors from around the world. 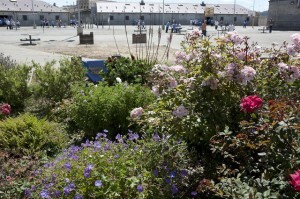 Garden volunteers joined other Alcatraz staff and volunteers to visit San Quentin prison. The day was certainly eye-opening, as we were able to freely speak with low-risk inmates who are determined to change their lives. Our conversation with them in a sun-filled plaza was in sharp contrast to our walk through a cell block not unlike those at Alcatraz. Experiencing the sights, smells, and sounds of a five-tiered cell block housing over 1000 inmates was an altogether different experience, beyond words. 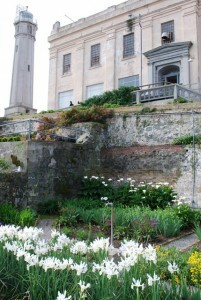 For garden staff and volunteers, Alcatraz is a wonderful place where we all choose to go and work in the gardens. It is easy to forget the true reason behind the gardens: that for Alcatraz inmates, the gardens were an escape from daily prison life. Alcatraz Island and San Quentin have a few commonalities – both prisons are located fairly close to each other on prime San Francisco Bay land, both have long histories as being a prison (Alcatraz beginning in the early 1850s as a military prison and San Quentin opened in 1852 as California’s oldest prison), as well as both being a community for staff and their families. But both prisons also share another surprising feature – gardening! 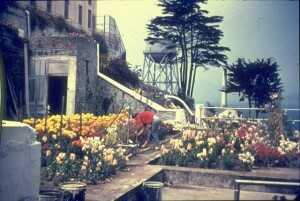 The military on Alcatraz recognized the importance of providing vocational training to inmates to enable them to learn a skill and inmates were allowed to landscape much of the island. As the maximum security Federal Bureau of Prison took over the island from 1933 to 1963, the inmates continued gardening allowing a few to find meaningful employment upon release. San Quentin has a remarkable rehabilitative gardening program, the Insight Garden Program that helps men reconnect to themselves, their communities and the natural world through the process of organic gardening. 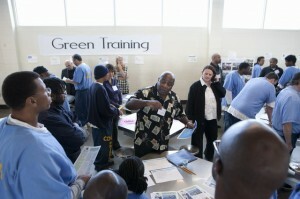 Led by Beth Waitkus, the community-based program teaches organic gardening skills and eco-awareness as well as the “inner gardener” aspect of healing — interpersonal skills development that encourages men to grow so they can contribute to their communities when they leave prison. Since it’s inception in 2002, the IGP has served more than 800 men. In 2003, participants built an organic flower garden on San Quentin’s medium-security prison yard that serves more than 1,000 prisoners. This oasis — in an otherwise bleak area — is the only non-segregated area of the yard, transcending the traditional segregation of prisons. The men enroll in the program because of their desire to change, an interest in gardening, and with the hope of creating a better life for themselves. With 70% of inmates returning to prison within three years of release, rehabilitation through gardening is a solution worthy of continued exploration. Programs like the Insight Garden Program save an estimated $50 000/year per inmate and also can help men prepare to become productive family and community members after release. The Insight Garden Program has set ambitious goals for the upcoming years — it has already begun to expand its classes which include topics such as nutrition, growing organic food and other sustainable practices. Ultimately, the IGP aims to start a re-entry program for the men to find employment in gardening, landscaping and “green” jobs when they leave prison. To learn more about San Quentin’s gardening program, you can follow their progress on Facebook and The Avant Gardener blog. I had the opportunity to host Patrick Albin through the gardens on a sunny day in February. Patrick captured the gardens and the volunteers enjoying their day. Patrick is the founder of the garden blog, The Garden Geek. This blog is a plant database based on people contributing their own photos, tips and tricks. 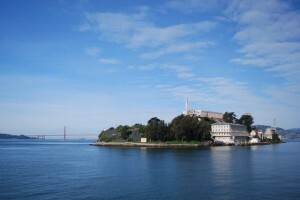 Follow the link here to read about his trip to Alcatraz and to see his fantastic photos. An hour after our garden walk finished, I found him lingering in the gardens speaking with a docent before making his escape from the island. I am not even sure if he did the audio tour.